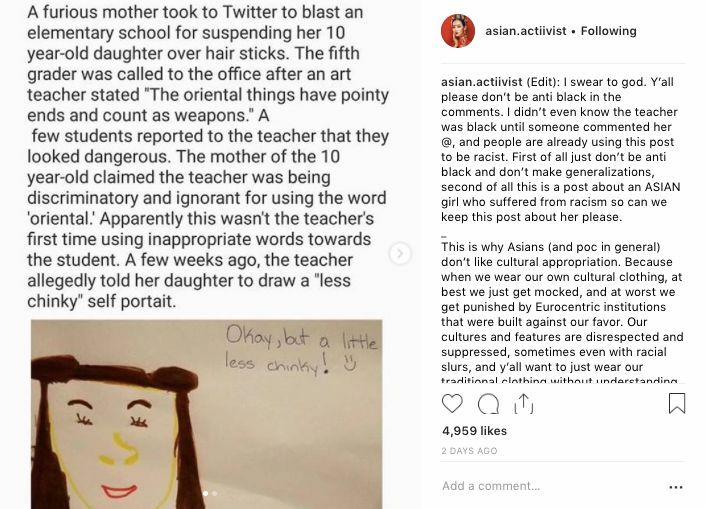 Last week @asian.actiivist, an Instagram account with over 13,800 followers managed by a 15-year-old girl in New York, got a teacher in Tennessee fired for using racial slurs against an Asian student. Speaking to babe, @asian.actiivist said one of her followers brought this story to her attention. Her follower DMed her two photos. The first was a summary that described the incident, and the second was a screenshot of a tweet from the user @LovelyLearynn. A furious mother took to Twitter to blast an elementary school for suspending her 10-year-old daughter over hair sticks. The fifth grader was called to the office after an art teacher stated, 'The oriental things have pointy ends and count as weapons.' A few students reported to the teacher that they looked dangerous. The mother of the 10-year-old claimed the teacher was being discriminatory and ignorant for using the word 'oriental.' Apparently this wasn't the teacher's first time using inappropriate words toward the student. 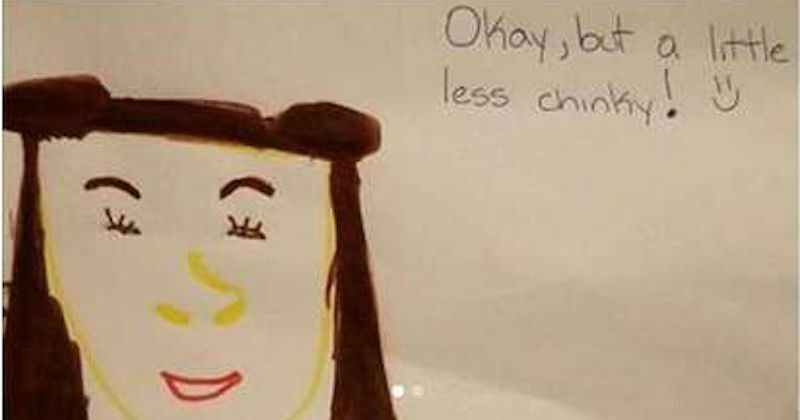 A few weeks ago, the teacher allegedly told her daughter to draw a 'less chinky' self portrait. Underneath the text was a photo of the self-portrait that the 10-year-old Asian girl drew of herself. The commentary next to the drawing reads, "Okay, but a little less chinky!" The second photo was a screenshot of the original tweet written by the mother of the 10-year-old girl. In the screenshot, @LovelyLearynn wrote, "My daughter has been crying for 3 hours straight. Suspended for the 'oriental things' in her hair! The teacher said they were a threat to the other kids. The teacher, Ms. Shonterikka Williams, has been discriminatory before." We contacted Learynn Kang, the woman behind the Twitter handle @LovelyLearynn. She confirmed both the suspension and racist slur written on her daughter's art class drawing. Kang said she had reported Williams back in September for telling her daughter to make her self-portrait "a little less chinky." 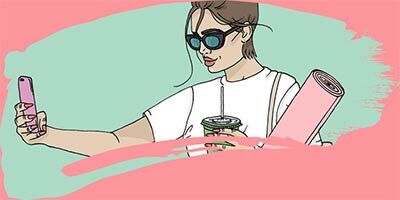 She sent us a photo of the self-portrait and it is identical to the one that was posted by @asian.actiivist. According to Kang, Williams was only given a one-day suspension following her complaint about the slur. 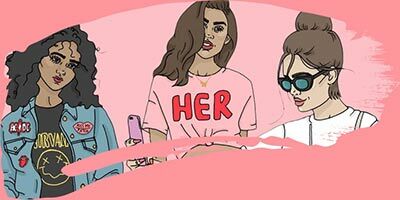 As soon as she shared the two photos on Instagram, her post blew up. 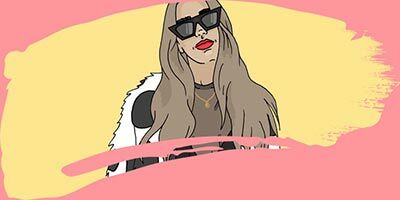 Right now, @asian.actiivist's post has over 6,800 likes and over 360 comments. "That teacher is a disgusting human and should be fired," one follower commented. "Message the school on Facebook and see if they take any action to get rid of the racist teacher," suggested another. Followers worked quickly to find Williams's personal information. One commenter wrote: "I found the teacher's Facebook but she's literally deleting EVERYTHING." Another added: "She blocked me off Facebook but her Instagram is @shon.williams1. She went private a few hours ago." 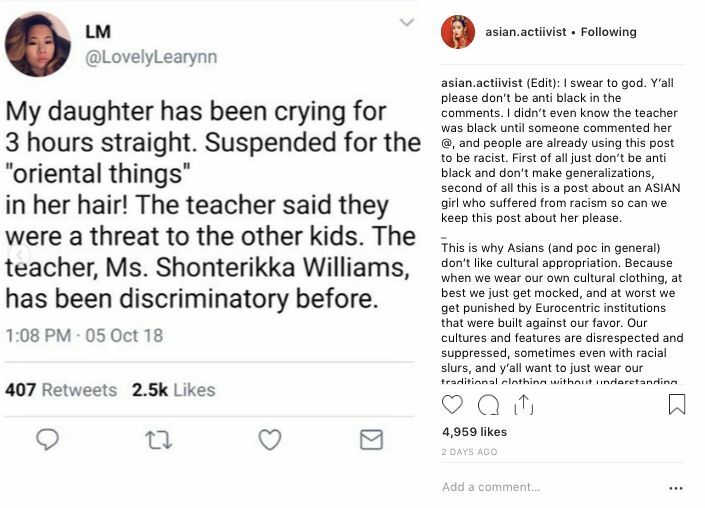 Her followers even found out which school Williams was a teacher at, even though this information was not included in either @LovelyLearynn's tweet nor @asian.actiivist's Instagram post. In fact, @asian.actiivist told babe that she doesn't even know which school Williams taught at. Her followers, however, discovered exactly where Williams worked and reached out to the school administration directly. Speaking to babe, one of her followers said that the school was called Valor Voyager Academy, charter school in Nashville, Tennessee. We contacted Valor Voyager Academy for confirmation. Principal Sarah Giblin confirmed to babe that Shonterikka Williams was indeed an art teacher at Voager Academy, and was employed there since February. On Wednesday, Williams posted on her personal Instagram account @shon.williams1, which has since been deleted, that she was fired from Valor Voyager Academy. 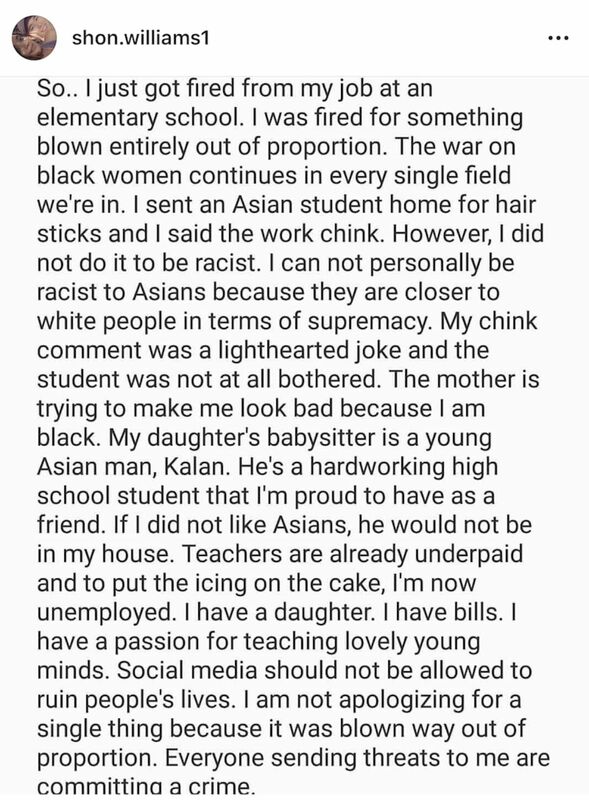 In her post, Williams admitted that she "sent an Asian student home for hair sticks" and that she "said the word chink." 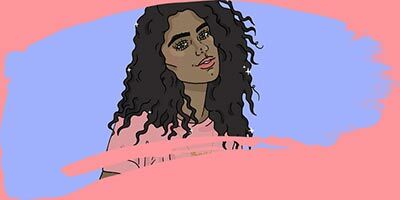 However, she claimed that this wasn't racist because it's not possible for her, as a black woman, to be racist against Asian people — "they are closer to white people in terms of supremacy," she said. Williams went on to say that her "chink" comment was a "lighthearted joke." 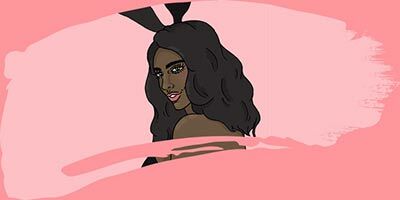 At the end of her post, Williams declared that she won't apologize for anything. Giblin confirmed to babe that Williams was fired last Wednesday. She also said that Williams was fired as a direct result of @asian.actiivist's post on Instagram. She said that when Kang first reported Williams for being racist toward her daughter, Williams was only temporarily suspended. "We looked into it and we gave the teacher a short suspension but we didn't feel the need to punish her any more," Giblin told us. However, that changed once the school was contacted by dozens of @asian.actiivist's followers and discovered the story was circulating on social media. "We got lots of emails from people on the Internet," Giblin said. "They told us that the teacher Ms. Williams had gone viral on social media. We must've received around 25 emails. We fired her because we didn't want her representing our school." While she was not directly responsible for Williams's firing, she said that she's happy with how everything worked out and she's grateful that her Instagram account was able to have a real-life impact and help make the school a safer environment for Asian students. 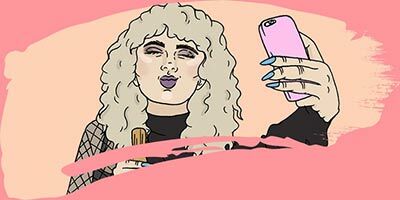 "Social media is super powerful," @asian.actiivist told us. "You might think, it's just a post. It can't change anything. But that's not true. Knowledge is spread super fast, super wide." If you have also experienced racism from your teacher, please email [email protected] to share your story. Your anonymity is guaranteed. 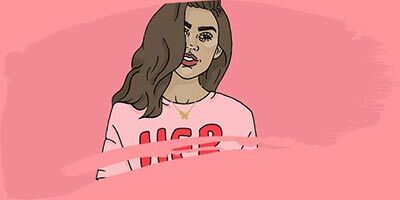 • Surprise! Curvy Wife Guy is actually super racist!